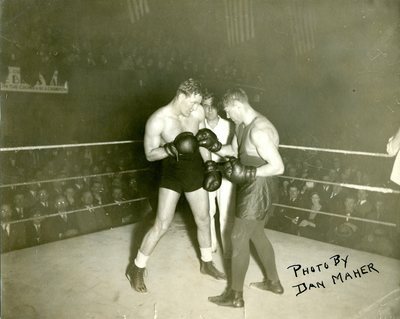 A black and white photograph of two boxers in the ring with a referee in the background. Labeled in handwriting, "Photo By Dan Maher." A note on the back reads, "Ernie Schaaf at Bangor Auditorium April 1st, 1932."